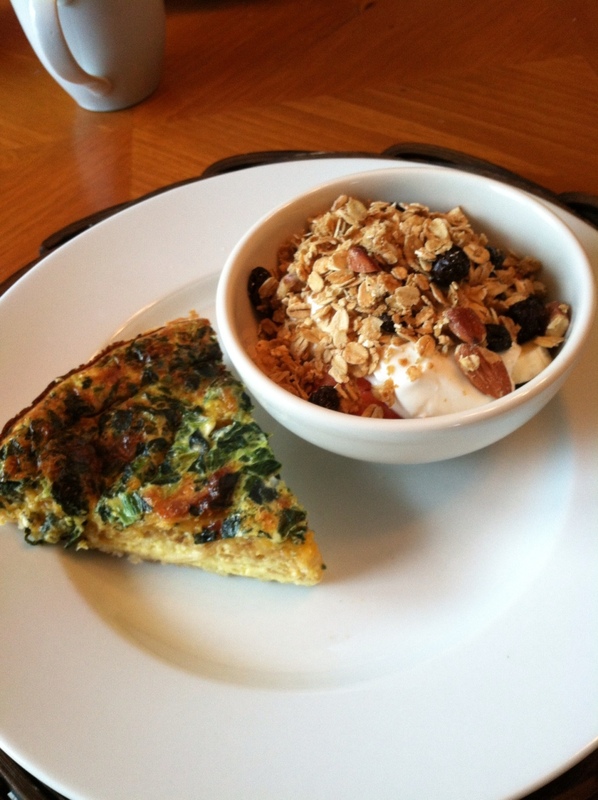 We had a nice summer brunch here this morning, and indulged in some Spinach Quiche and homemade granola- what a scrumptious combination! Preheat oven to 250 degrees. In large bowl, mix oats, nuts and brown sugar. In a separate bowl, mix salt, oil and maple syrup. Combine both bowls together and pour onto 2 sheet pans. Bake an hour and 15 minutes. Put granola in a bowl and mix in raisins. Let cool and then store for up to two weeks in an airtight container. Feel free to substitute whatever nuts you prefer! Preheat oven to 450 degrees. prepare pie crust in a 9 x 13 pan, or a regular size pie pan and a smaller pie pan or dish. Whisk together all ingredients except onions and cheese. Sprinkle onions and cheese on bottom of dish(es), and pour egg mixture over the top until it is about 3/4 of the way up the dish. Bake for 40-50 minutes, or until lightly browned on top and the middle does not jiggle.